Are we in for a stockmarket crash in 2017? What’s in store for the stockmarket this year? The following research note will be updated periodically as financial and political events dictate. Please note this material is intended for British investors and savers. It is designed to help you navigate the stockmarket risks and opportunities this year. 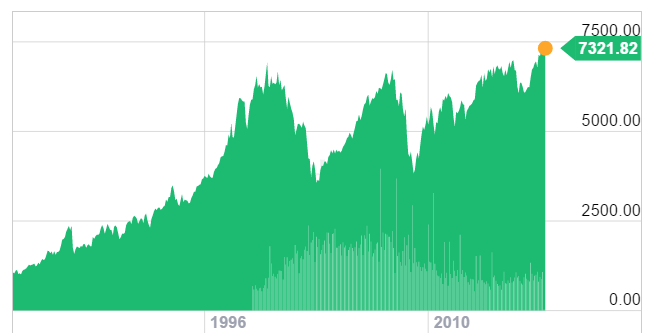 It’s been a remarkable two decades for the British stockmarket. We’ve had three booms and two crashes. In the end the FTSE 100 index has gone nowhere, especially adjusted for inflation. Less than half the companies included in the FTSE 100 index in 1999 are still there, so it’s been incredibly difficult just to match the index with your own portfolio. There’s never been a better illustration of how important it is to be aware of the big-picture risks and opportunities if you want to succeed in investing. A technology and property bubble dominated the stockmarket’s performance. Compared to other countries, our stockmarket has done OK. Over the last ten years we’ve outdone most European markets, almost kept pace with recession-proof Australia, but the US index surged above our own. That’s the past. Today we’ll look into the big-picture risks and opportunities we face this year. At this point investors are asking themselves if we’re still stuck in the same sideways trading range that’s typical of bear markets. Or are we finally breaking out and set for a new boom? The answer lies in which events come to pass at home around the world. Britain is certainly not isolated. I’m not going to predict what will happen to the stockmarket this year. That’s a mug’s game. As the economist John Maynard Keynes once said, the market can stay irrational longer than you can stay solvent. So even if you’re right about everything that comes to pass, timing can be your undoing. Instead of predictions, I’m going to make you aware of the factors that will determine how the stockmarket performs. If the positive boom stories unfold, the market will go up. If the negative doom crises come to pass, the market will crash again. To predict the stockmarket, all you have to do is keep tabs on these factors. That’s what we do each day at Capital & Conflict.